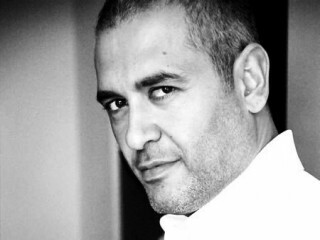 Elie Saab is a Lebanese fashion designer. Elie Saab was born in Lebanon on July 4, 1964. In his youth, Elie Saab developed an infinite curiosity in art. This great interest led him to enter the fashion world aggresively. Thus, as a start, he began designing evening gowns and wedding dresses. His first fashion house opened in 1982, in Beirut, under his own label. In the same year, Elie Saab launched his first collection at the Casino Du Liban. It was a major success and enjoyed massive media coverage. The Lebanese press referred to him as the precocious genius. Deeply attached to his native culture but constantly fascinated by the European fashion, his style was a perfect blend of Eastern and Western cultures. The 1980s saw Elie Saab's career expanding. His reputation spread throughout the Middle East attracting royalty to his fashion House in Beirut. The finesse of his work spread overseas to include private fashion shows in Paris, Switzerland etc. In 1997, Elie Saab was the first foreign designer to present a Spring/Summer Haute Couture collection at the Roma Alta Moda week. Since then, his fashion shows are presented in Rome. In 1998, The Ready-To-Wear line, manufactured exclusively in Italy, made it's debut to the first 1998/1999 Fall collection and was presented in Milan. It was a great success and orders flew from all over the world. During that summer, Elie Saab exhibited a collection of evening gowns at the plaza of Monte Carlo casino attended by princess Stephanie of Monaco and other celebrities. Since the new millenium, ELIE SAAB collection has been on the catwalk in the capital of Fashion, Paris, at the "Paris Fashion Week" of Haute Couture. March 2002 Saab dresses best Actress Award Winner Halle Berry during the 74th Annual Academy Awards. Spring 2003 Elie Saab becomes invited members of the "Chambre Syndicale de la Couture" and is invited to show during the Fall/Winter 2003 Haute Couture collection. September 2003 Saab dresses Emmy award winner for "outstanding actress in a comedy series", Debra Messing, to the 55th Annual Emmy Awards. View the full website biography of Elie Saab.